Written by Yuliya Valko on 03/16/2018. What can motivate you to quit a successful career and start your own business, especially when you are a part of a high-performing team at Google? 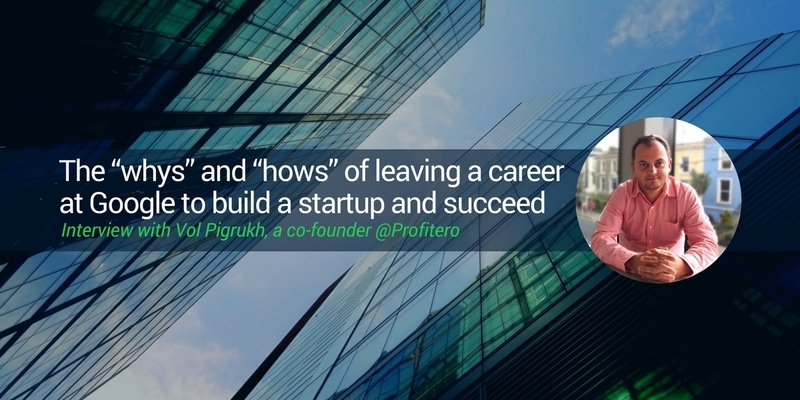 Recently we’ve got the chance to speak to someone who has done exactly that: Vol Pigrukh is the co-founder of Profitero – an innovative company that provides retailers and brands with a comprehensive solution for e-commerce analytics. Vol has shared with us valuable insights on how to design a smart transition from a corporate career to owning a business, how to win big customers as a small company as well as many other interesting lessons learned from his entrepreneurial journey. ZeyOS: Tell us few words about your background and describe your company profile. Vol Pigrukh: I am an entrepreneur specializing in the areas technology, sales and marketing, having worked at Microsoft, Accenture and Google before I started my own business. I hold an M.Sc. degree in International Business and a B.Sc. degree in Computer Science, a combination which helps a lot in running a tech company. 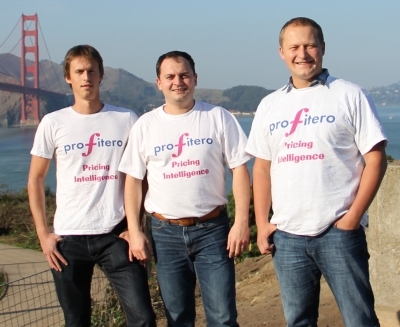 In 2010, me and my two partners founded Profitero – a company that provides retailers and brands with the monitoring and analytic tools for maximizing their e-commerce performance and driving sales. ZeyOS: How did you come up with your business idea? Vol Pigrukh: As it can happen in life, it was born out of the frustration on the part of the actual user – which is probably a very good starting point. The original idea thus did not come from me but from our co-founder Kanstantsin who was reselling many products on the internet, including laptop accessories from leading manufactures. He didn’t know how to price his products, so he developed a solution to monitor prices for the products on other websites and started to leverage that data for his own price management. Within several months, his solution became successful and he was able to price better. Then the idea came to his mind that he could turn his invention into an actual business. We started with competitors’ price monitoring for retail customers, but after working more closely with our customers, we developed the understanding that there was an even bigger value to be derived from this. E-commerce is a fast-growing channel; the volume of sales is continuously expanding, and more and more people are buying online. But there is no advanced e-commerce analytics tool for both retailers and manufacturers in this channel. They were just “flying blind” in e-commerce sphere, since there was no way for them to measure their positioning and performance online. The bigger solution was to provide a comprehensive analytics suite for large manufacturers and retailers to help them sell more online. That’s how we got to our final big business idea. ZeyOS: What differentiates you from others? Vol Pigrukh: The answer depends largely on how you look at the market. Back in the early 2000s, there were some companies that were doing price monitoring and other companies which were doing e-commerce analytics based on search ranking and review analysis. But there was nobody who offered an integrated solution for both at the time. We were thus the first company on the market who managed to connect all demand factors from product content, video, images, search ranking, ratings and review to Amazon sales. This is very important, and our customers’ feedback confirms it on a daily basis. We create that direct link to Amazon which allows our customers to monitor how each action such as adding or changing product content or improving search ranking etc. influences their sales. There is no competitive solution which connects these demand metrics to the actual sales. We are still the only company who is properly doing it on the market. ZeyOS: Why did you decide to quit your successful career at Google and start your own business? Vol Pigrukh: Google was great, I’ve worked there for 2.5 years. I was responsible for selling AdWords to large businesses in the Ukraine. When I started, I was the second person in the Ukrainian team. The company was developing very fast and it was very interesting to work there. During 2,5 years our team was able to achieve some really great results in it's performance and revenue growth. I’ve learned a lot, and this was one of the biggest advantages that I’ve got from working at Google. How was it to leave? I think you need to look inside yourself and think about what motivates you. I’ve always wanted to have my own business. I had already owned a smaller business before. Even working at Google, I was constantly thinking about what I could do on my own. I think the 2.5 years spent at Google were great in terms of the working conditions, the team and the overall experience. But for me, at a certain point, it was simply time to go. I felt that I had learned everything I could learn. Google is still a great company, but it’s becoming more hierarchical with an increasingly complicated bureaucracy typical for big corporations as has happened for instance already with Microsoft. ZeyOS: Isn't it like leaving a safe harbor and navigating in unknown waters? Develop a minimum viable product to test your hypothesis. Once you have received some positive feedback and everything points into the direction that your idea might actually hold the potential for founding a solid business, then you can go on to actually start working on it. Otherwise you might make mistakes that you will regret later. In our case, when I was leaving Google we had already had many crucial positive indicators, which made it clear that our idea could be turned into a big business. ZeyOS: What are the most valuable business lessons that you have learned while working at some of the world's leading tech companies? Vol Pigrukh: There are many things that I’ve learned along the way. I keep learning and I still make mistakes, because you learn as you go, and this is perfectly normal. What I took from my time at Google is that as a fast-growing team on a new market you need to go through a long experimentation period, trying different things that sometimes work and sometimes don’t. I think this continuous business experimentation helped a lot with developing Profitero. For example, last year in October we launched our free trial of Amazon analytics. The customers could try it for free for 30 days and then decide if they wanted to pay for it. It was kind of a soft launch. We tested it on some 10 to 20 potential customers, reviewed the feedback and implemented it. Once we knew our solution really worked, we put it in our marketing hands and started to push it all the way through. So, test loops really help. Listening to the customer is what they practice a lot at Google. My main advice is to learn as much as you can from customer feedback, because it will help to perfect your product for the future. ZeyOS: What did you find the most challenging in starting a company? Vol Pigrukh: For the first three years there were many challenges linked to uncertainty. We didn’t fully understand who the main customers would be and what we would be providing them with. There are a few crucial types of business risks in the venture capital world that entrepreneurs need to consider: the team risk, the product risk, the market risk and the commercial risk. We went through all of those risks. This is the hard part when you are crossing these sorts of chasms: Will your team be successful? Will your product be successful? Attached are a lot of difficult decisions to make. ZeyOS: What was the most helpful factor in overcoming the difficulties? A great team. We started as a team of only three people – the co-founders. Then we added a few more team members. Those early people at Profitero took up a lot of uncertainty upon themselves. We were learning from each other and supporting each other. Our customers. I was the main sales guy for the first three years, so I was able to speak directly to them, learn their needs as well as their pain points. Support from the family. When you go back home, and you feel the support and understanding of your loved ones, it really goes a long way. ZeyOS: What makes you an innovative tech company? Vol Pigrukh: We offer a more comprehensive solution that connects the demand to sales. I would emphasize three main points: 1. A strong team on the business and the technical side. 2. An open ear to customer feedback. 3. The right kind of expertise: The ratio of commercial to technical functions at Profitero is inverted with regard to other companies in our field. Compared to other companies which tend to have more commercial and less technical stuff, our team is made up of 70% tech and only 30% commercial. This setup helps us to innovate faster and develop a scalable solution that has a continued support. Last year we received Gartner’s 2017 Cool Vendor of the Year in Digital Commerce award, and became the first e-commerce analytics company to join Nielsen’s Connected Partner Program. ZeyOS: How did you manage to acquire the world's leading retailers and consumer brands as your customers, given that you are a relatively young company? Vol Pigrukh: It’s like the chicken and egg problem. You don’t win large customers until you win large customers. You need to establish trust with them and then other large customers will buy as well. We started with selling to anybody who would buy our solution. Our first customers were some 5 to 6 smaller customers before we won our first big customer, the UK’s largest online grocery retailer Ocado. Once we had won them as a customer we worked together to develop our solution in a way to cater to their every need. We learned more about use cases of a large customer and in this way got ready to work with other large customers. So, it’s good to start out with somewhat smaller companies and then go and try to partner with larger players. Learn their needs, their pains and their use cases, and develop the solution that addresses each of them perfectly. Then you discover that your solution is also suitable for other large customers. This is how it works, and I’d recommend this kind of three-step approach to any B2B company. ZeyOS: How do you prefer to work – in the office or remotely? How do you manage your distributed team? Vol Pigrukh: Usually I work from the office. The thing is that we have many offices. The headquarters are located in Dublin, UK, then there are two offices in the US, and recently we have also opened one in Shanghai, China. I work starting with Dublin hours and finish in Pacific Standard Time. Of course, it would be ideal to have everybody in one and the same office, but it is not practical anymore. If you are a big company that wants to address different markets, you want to hire the superstar people that might not necessarily be located where you are. It is not that we’ve decided to do it that way, we simply had to do it. But if you structure the internal communication processes properly this model can work very well. Keeping an ongoing strong connection is something we are constantly working on to ensure successful team collaboration. ZeyOS: How do you leverage business software and other core office apps to optimize your daily business activities? Which features do you find the most useful? Vol Pigrukh: It’s chats that help to keep up an ongoing communication and to have an immediate connection in real time instead of e-mail. Then there are the CRM systems to work with the customers, and a lot of marketing tools to measure the marketing funnel in order to be able to improve each step. We prefer to have integrated all the solutions in one single system. ZeyOS: What excites you the most in business and life? What motivates you? Vol Pigrukh: I think what has been keeping me motivated all that time, 7,5 years, is building something from the start and watching it grow with every little step. Every day you see some progress in some areas. And every day is different, there are no same days in startups. It gives you both the adrenaline and the satisfaction. Running a startup, you can’t separate the business from your personal life. Either you are all in or all out. I’ve seen people who wanted to separate their business and their personal life and work from 9 to 5. It just doesn’t work. Usually such people fail. If you want to run a startup, do it all in and then try to balance it with your private life. Be sure that it is something you are passionate about, because it takes time to grow it. There is no overnight success. ZeyOS: What advice can you give to entrepreneurs-to-be? Vol Pigrukh: : If you want to start a company, start from the idea that you are very passionate about. Put all your thoughts and all your mind into it. Don’t do it half-heartedly and you will succeed. Yuliya is responsible for accomplishing all of the day-to-day marketing activities for ZeyOS, along with researching and developing new business opportunities and plans. She loves to engage with customers through social media and provide them with the latest updates about the digital workspace at ZeyOS.